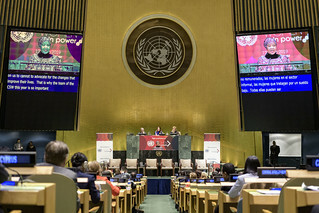 Phumzile Mlambo Ngcuka (on screens and at podium), Executive Director of the United Nations Entity for Gender Equality and the Empowerment of Women (UN Women), makes remarks at the opening of the high-level event on "Women in Power", hosted by María Fernanda Espinosa Garcés (centre at dais), President of the seventy-third session of the General Assembly. Also pictured at the dais are: Secretary-General António Guterres (left) and At left at dais is Secretary-General António Guterres, and Catherine Pollard, Under-Secretary-General for General Assembly and Conference Management. The event focused on identifying barriers that hinder women’s participation and leadership, and on the sharing of best practices that can accelerate women’s empowerment in this area.